Many people tell us that foster care is something that they may have thought about for awhile. Maybe you know someone who was a foster parent or foster child? Maybe you saw something on TV or an ad in the newspaper? Maybe you saw a post on the internet? Maybe you just thought it sounded like something interesting to do? I care about children and want to help them. Children and youth in the foster care system have been abused, neglected, abandoned, and face tremendous obstacles. Foster parenting is a powerful way to lift up the heads of children and youth, and show them that there is hope for the future. I am kind and loving but can be firm when it’s required. While a lot of love is a nice thing to provide, foster parents also must have good parenting and communication skills. Being patient, consistent and following through on rules and expectations are all important. I think I did a good job as a parent and know how to work with children. I’d like to use my skills to help other children. Having parenting experience is helpful. This may provide a foundation in parenting a foster child who may have experienced abuse, trauma, and separation. Every child is different, and a good parent is able to learn from their experiences and address the individual needs of each child. I didn’t have children. By being a foster parent I can share my home and give my time and attention to a worthwhile cause. Everyone has to start sometime. Children do not come with an instruction manual. Being open to learn parenting skills with the guidance and support of experienced caseworkers will give a person the tools to be an effective parent. As a foster parent, I realize my job is to make this child feel comfortable and accepted in my home. I know that someday the child may leave and that’s okay. The first goal for a foster child is to feel safe in a warm, nurturing environment that is able to provide for their physical needs. As these basic needs are met, a child is able to advance to forming attachments and expressing affection. They learn to communicate their needs using appropriate words and actions. Finally, the child displays a healthy sense of self-esteem, form connections with others, and develop future goals. When a child leaves a home, whether after a few months or a few years, saying goodbye is never easy. Some foster parents feel comfort knowing a family has been successfully reunited and you played a part in it. Other families hope that their involvement with the child will plant a seed that takes root and will grow within the child, producing amazing results in years to come. I feel the need to give back and want to share my experiences, time, and good fortune with a child. A person may have had their own challenges in life- losing a parent, dealing with a family member’s addiction, or experiencing abuse. The resilient person has had the strength and support to overcome these situations and wants to use that knowledge to help others. Other people may never have faced these difficulties and feel a sense of gratitude. A person may also feel altruistic (whether through culture or faith) and want to help those in need. I don’t feel done parenting. The energy, joy, and excitement of children can be contagious. As an adult, it can be fun to spend the day outdoors at the park or reading a child her favorite book for the fiftieth time. Grandparents appreciate the time they have with the grandchildren, partly because they feel experienced. Children can have a special, and more open relationship, with a grandparent where they feel comfortable sharing deeper feelings and thoughts. I want to have a positive impact on a child and our community. Foster parenting goes beyond helping an individual child. Foster parents help fight the problems of homelessness, substance abuse, mental health, domestic abuse, poverty. While caring for foster children, foster parents give a child’s birth parents the chance to receive the necessary help to overcome problems that may have led to the removal of the children from their home. Foster parents can also be role models to birth parents on better ways of parenting the children. I enjoy a challenge. Each child has their own unique needs and challenges. You’ll also get to work with many different people, from caseworkers, therapists, doctors, and school personnel. No two days will be exactly alike. There are not enough homes for older children and sibling groups. The bond between a brother and sister is one of the longest relationships a person has in life. It can be a heart-breaking struggle in finding homes for sibling groups of three or more. When siblings cannot be placed together, a child has to deal with the additional separation of being away from parents and brother or sister. Another challenge is finding homes for older children. Adolescence can be a trying time when youth are seeking independence. However, these teens are also hurting, having experienced abuse and betrayal. They are looking for someone to be committed to them and help them succeed. 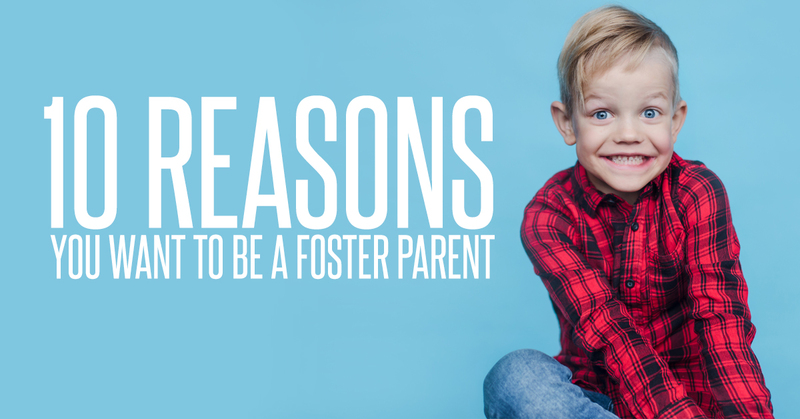 We’re sure there are other good reasons to become a foster parent. We’d love to meet with you to talk about how you can join us in our mission to give hope, help and healing to children, families and communities. Foster parenting may be the most challenging job you’ll ever have, but it can be the most rewarding one as well.